$12.41 $6.64 You save: 5.77 ! MASTER CAMO - COLOR CORRECTING PEN by MAYBELLINE. 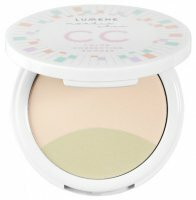 Colored concealer. High degree of pigmentation enables building of opacity. The product is available in 6 different colors, which will help camouflage many types of skin blemishes. The sponge applicator guarantees precise distribution of concealer. High degree of opacity and pigmentation. It guarantees trouble-free and precise application. - 60 RED - neutralizes dark circles, for use on dark complexion. During the first use, turn the bottom part of the pen 10-15 times or until the product is visible on the sponge. Then apply the cosmetic to area of ​​that needs to be corrected. Apply foundation on the concealer in order to even out the color.